Cala Galdana is an ideal destination for families or couples looking for a peaceful quiet resort with excellent amenities. The resort is located at the base of the Algendar Gorge that helps create a dramatic landscape, of high cliffs covered with aromatic pine trees with spectacular views. The Algendar river divides the resort with the district to the west known as Serpentona. 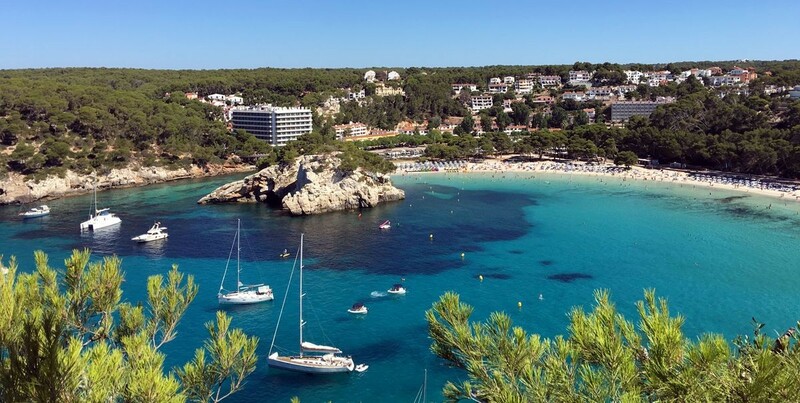 The beach in Cala Galdana is spectacular and one of our favourites. It was awarded the Blue Flag beach award in 2016 indicating its high environmental, quality and safety standards. The beach itself It a large crescent-shaped white-sandy beach, backed by aromatic smelling pine tree and towards the south side surrounded by rugged cliffs. The beach is sheltered and protected by its shape and aspect and perfect for families. The beach is protected by several lifeguards and there a good range of beach activities available such as kayaking, paddle boats and stand up paddleboards (SUP) to hire. Snorkelling is also recommended on the south side of the cove. There are also several well stocked beach side shops and a good range of restaurants and bars. Toilet and shower facilities can also be found.